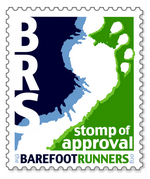 I had the pleasure of finally meeting Thea, a fellow barefoot runner, barefooter, and BRS member. She and I both have essays in ON FOOT: Stories of Backpacking in the Grand Canyon, published by Vishnu Temple Press. We both were part of the reading/opening party for the book, held in Flagstaff, at the Grand Canyon Trust. Thea's essay is about going barefoot Rim To Rim. The whole book is great, I'm honored to be in it, and I'd buy it even if I weren't included. Here's the link to Vishnu Temple Press where you can order ON FOOT. Or ask your local bookstore and library to order it!